Wondered if you had seen the picture and discussion on the IGS Forum showing a Dobro bass, from the 1930's. There were supposedly a couple of these made in the 1930s. One of them was destroyed in a fire and the other one is in Don Youngs hands I believe. I had a discussion about its restoration with him about 20 years ago when he was starting the NRP thing. He said that the one he had had no metalwork and that one day (hah ha) he would get around to making the dustbin sized cone to fix it up. 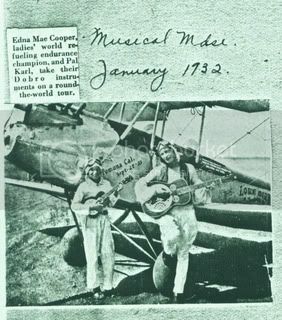 The picture is based around Edna May Cooper who was a Dobro player and endorser of Dobro instruments in Dobros early 1929 catalogues together with film stars like Ukulele Ike, Bessie Love and Ramon Navarro. She and Bobbi Trout won the long distance re-fuelling championships by flying for days over Los Angeles airport. I have some pages of Rudy Dopyeras scrapbook which details her exploits and another picture which shows her setting off with Bobbi carrying her Dobro!!! Rudy could obviously see the marketing value. 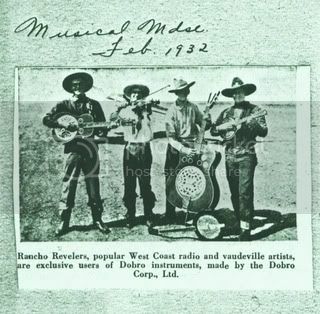 If you're interested - the group around the plane who own the Dobro bass are called the Rancho Revellers. To complete the story, here is Edna Mae (I've no idea where KARL comes into the picture??) about to set off round the world serenading! It's nice to see a clear print of this one, and as Mark has explained it is a great story. So if Karl is holding a tenor, what size clue does that give us about him? Do the relative sizes of the tenor and the standard Dobro held by Edna Mae lead one to conclude that the tenor is being held by someone who is the size of a child? (I'm asking this because when I first looked at the pic, I just assumed that it was a picture of the two female pilots, that they were holding the same-sized instruments and that the one on the left appeared smaller because she was further from the camera. Now I don't think that's the case, and if the tenor is a smaller instrument, which I take to be the case, then that supports the idea that "PAL KARL" is a child.) What do you think? Thanks for revitalising this thread. The Dobro bass on eBay did get a few people talking and sharing photos and information. We are currently of the opinion that four of these exist, or existed. They are all different and the one in the eBay auction is not the one in the photo that the seller showed with it. Don Young (Rancho Revelers band) supposedly owned the bass into the 1970s. When he owned it, the bass had no resonator parts and the neck was converted to fretless. The Dobro Bass was a display showpiece at Freedom Guitar's store on Sunset Blvd. in Hollywood, California until 2004. In 1988, the bass was refinished and refretted by flamenco guitar luthier Benito Huipe who did guitar repairs for Freedom Guitar’s Sunset store in the 1980s. In 2008, a resonator spider assembly was sand cast to fit the bass’s larger sound hole. A replacement aluminum cone was also spun, and a cover plate was spun and laser cut to match a 1930s pattern, but enlarged to fit the larger soundhole of the bass. That completed all restoration work done to the bass. In 2011 the bass was listed on ebay, but it did not reach the minimum bid. 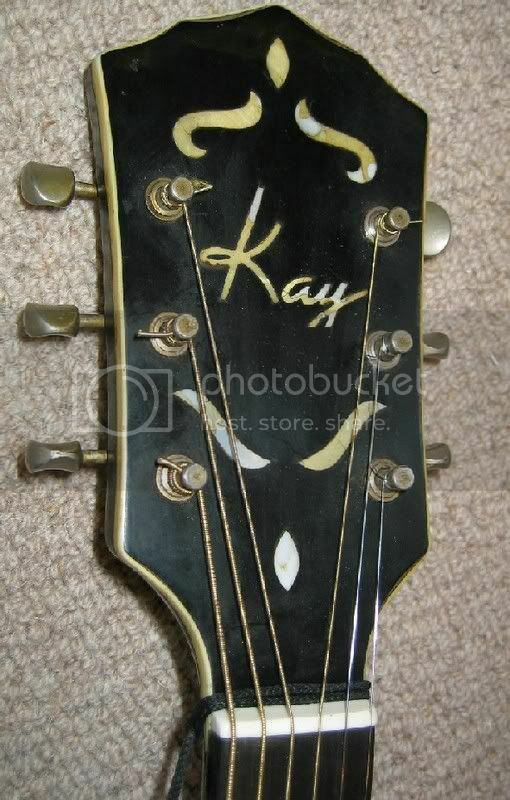 The pictures on ebay are of the actual bass in its present condition. Pal Karl's "tenor" is the Model 30 Dobro tenor ukulele--not a tenor guitar.